Let's go ahead and assume that Apple (Nasdaq: AAPL) is preparing to release a smaller version of its iPad, which is now frequently referred to as the "iPad Mini." While I think "iPad Nano" or "iPod Touch XXL" have nicer rings to them, we'll just have to go with what sticks until Apple makes it official. There's no shortage of evidence of this device's existence, from credible reports from Bloomberg and The Wall Street Journal to purported leaked pictures of plastic molded engineering samples. I'm going to operate on the assumption that it's just a matter of time before this tablet sees the light of day. Importantly, the iPad Mini shows some important strategic characteristics of Apple and how it approaches the Innovator's Dilemma. Harvard Business School professor Clayten Christensen's famously influential book describes one of the problems that contribute to companies' spectacular failures while at the top of their game: the hesitance to move downmarket. This transition into lower-margin and less certain markets is frequently held back by established value networks and the traditional and natural profit-seeking motives of companies, but it can frequently lead to companies failing to see or address disruptive technologies that pose future threats. You could argue that smaller 7-inch tablets, particularly Amazon.com's (Nasdaq: AMZN) Kindle Fire and Google's (Nasdaq: GOOG) Nexus 7, pose a disruptive threat to larger 10-inch ones, as they enjoy certain advantages in things like price and portability, two values that mobile consumers prioritize. Smaller tablets make some sacrifices in performance and usability, but as we've seen in various industries, disruptive offerings usually achieve performance parity eventually and then quickly invade upmarket. Theoretically, Apple could have rested on the tremendous success of the current 9.7-inch iPad, the fastest-growing Apple product ever released in terms of both unit sales and revenue. Instead, the company is moving downmarket to meet and challenge Amazon and Google and others head-on, even though that probably entails lower margins and potential cannibalization of its own higher-end and more profitable products. Shortly after Steve Jobs' death, James Allworth, who co-wrote a separate book with Christensen, described how Jobs had solved the Innovator's Dilemma. It's no coincidence that the book was also one of the most influential business books to Jobs, but he solved it by placing higher priority on creating excellent products over generating profits. "Microsoft tries to find pockets of unrealized revenue and then figures out what to make. Apple is just the opposite: It thinks of great products, then sells them. Prototypes and demos always come before spreadsheets." How's that for deceptively simple? Step 1: Think of great products. Value creation for customers is the primary goal, and once that happens, cannibalization and self-disruption become secondary. Instead, they become natural consequences of delivering new products that customers want to buy. Apple in particular also happens to have a knack for knowing what customers want before even they do. It's worth noting that Christensen himself has expressed concern over Apple's proprietary business model, noting, "The transition from proprietary architecture to open, modular architecture just happens over and over again." On the other hand, Christensen has also said that Apple is the one anomaly in his disruption theory: "There's just something different about those guys. They're freaks." The first comment about modular transitions was part of a conversation with one of Christensen's best-known students, Horace Dediu, founder of the mobile-centric analysis blog Asymco. Dediu aptly points out: "Apple does have a self-destructive instinct. It hasn't been one where they have hurt themselves very much doing it, but rather slowly deprecating their previous successes." There are numerous examples of this self-destruction. 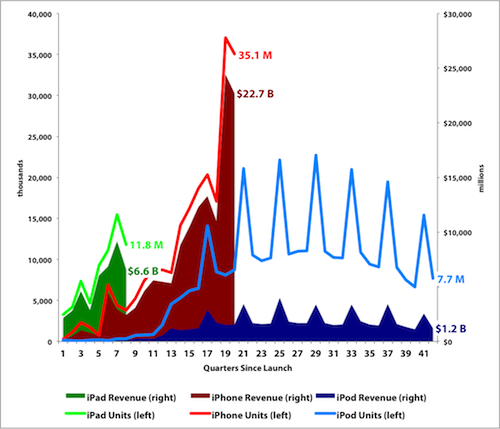 The iPhone disrupted and cannibalized the iPod. The iPad is currently disrupting and cannibalizing the Mac. The iPad Mini will probably disrupt and cannibalize the original iPad. This organizational prioritization of products over profits is how Apple has solved the Innovator's Dilemma. Even the executive hierarchy that Jobs instilled reinforces this, where the CFO is the only person in the company responsible for the bottom line. In this way, low- and mid-level managers, who would otherwise filter out unprofitable but potentially innovative and disruptive ideas, don't need to focus on profits and are freed to concentrate on making a great product. And the rest will follow. Let's face it: Apple is a freak of business nature. That's also why it continues its unprecedented growth run, and the next freaky milestone may very well be a trillion-dollar market cap. Sign up for our brand-new premium Apple research service catered to current and prospective Apple investors that lays out all of the iPad maker's opportunities and biggest risks.